We had a wonderful Christmas, very busy. Babes Mum flew in from Cairns Australia on Christmas Eve morning so we hosted a family dinner on Christmas Eve followed by breakfast on Christmas morning before we drove off to Hamilton, one hour south of Auckland to spend the rest of the Christmas with Babes Dad and his side of the family. 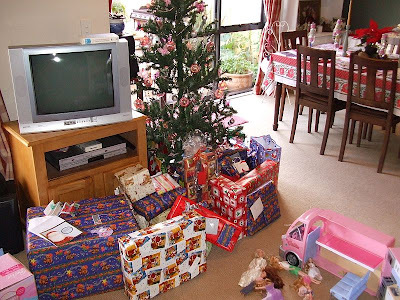 Here is our Christmas tree with an obscene amount of gifts under it. A large proportion of which were for The Princess who was beside herself with excitement! Santa gave her a big pink BARBIE party bus!!!!! Its very cool, has a fold out hot tub that actually makes a bubbling noise!!!! You can see the bus in this photo. 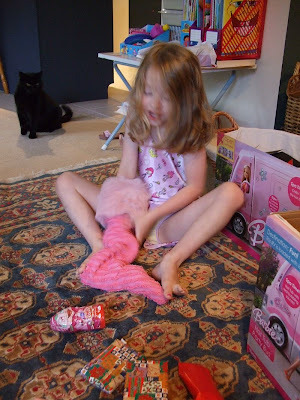 Here is The Princess first thing on Christmas morning opening the stocking I had whipped up for her the day before. 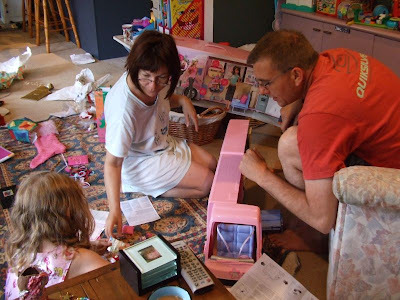 This is Babes, The Princess and I playing with the Barbie bus early on Christmas morning. Here she is dressed in a new Dora Explorer beach dress and wearing a new hat and matching bag. That's Babes Mum on the right and mine behind The Princess. It wasn't all pink, she was given this hideous Spiderman mug. She adores it as she plans on marrying Spiderman!! But mostly her gifts were pink. 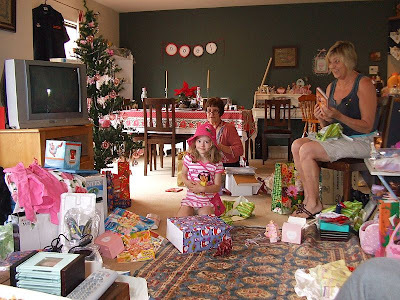 Due to splits in both our families and her birth family still having contact with her, she has 6 grandmothers, 5 grandfathers and numerous Aunts, Uncles and cousins which means she gets a ridiculous amount of gifts each year. 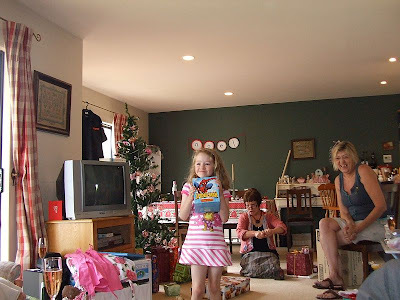 Santa gave her the Barbie Bus and stocking fillers, we gave her a ballerina jewellery box and the pink bag and hat, from everyone else she got a large pool, toilet bag complete with toiletries, pyjamas, 3 dresses, DVD, Barbie overnight bag, another bag, heirloom bear, books, more clothes, 3 paper doll books, crayons, Lego, hair ties and clips . . . . way too much !!! She's a much loved and very lucky little girl. The last few days have also been quite busy, another family dinner at our house for Babes Mum and then lunch today at my Mum's with some cousins. We are off to Babes Dad's beach house for a break. Its at a beach called Whangamata and the house is just a 5 minute walk down to a beautiful beach where we spend most of our days. 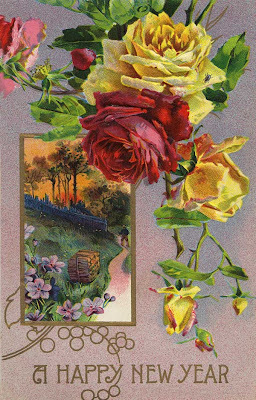 My life has been truly enriched over the last few months by all of you wonderful caring and creative fellow bloggers. At times blogging has been a sanctuary for me and for that I thank you all. I will have a toast to you all on New Years Eve, with .... Champagne of course!